CES 2011: Panasonic Viera Cast to become Viera Connect | What Hi-Fi? Most signficantly, and unlike Viera Cast, Viera Connect is an open platform, which means it will be available to developers of third-party content. 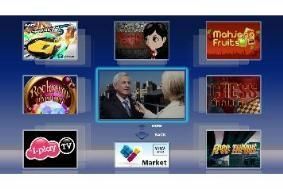 This will be collected into a new Viera Connect Market section, where users will be able to select individual apps to personalise their IPTV portal. New apps will include Facebook, eBay, and Napster, and there will be more ways to stream video content, although specifics for the UK are yet to be announced. Panasonic is also pushing the gaming side of Viera Connect, and gave a demo of a racing title called Asphalt 5 during its CES press conference. Unlike the very basic puzzle games that are generally found built into TVs, Asphalt 5 boasts 3D graphics and online multiplayer, and can be controlled using the TV remote control or a standard USB controller. Expect UK timings and titles to be announced closer to Panasonic's European press event in February.